Lunch and dinner for vegetarians and vegans! On monday, we offer a vegetarian lunch & dinner with seasonal products. All ingredients are organic vegetables and seaweeds. made of shiitake (chinese mushrooms) and konbu (laminaria). Our restaurant wants to promote the growth of organic agriculture in Japan. 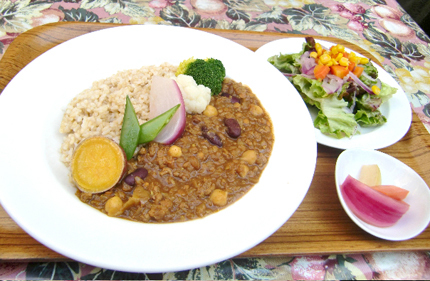 Please join us in our efforts and enjoy the delicious organic vegetarian dishes! We are accepting reservations(only dinner).